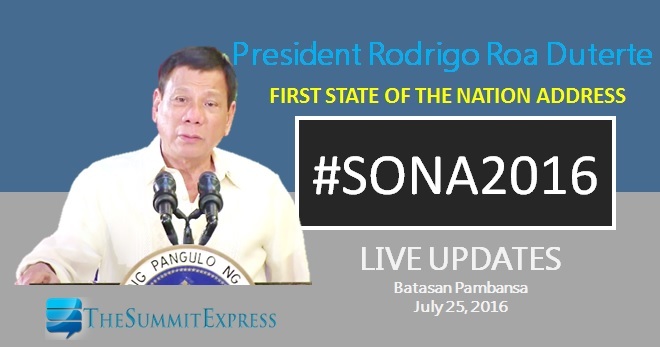 MANILA, Philippines - July 25, 2016 (Monday), a historic day for the Filipinos as President Rodrigo Duterte is set to deliver his first State of the Nation Address (SONA) was not declared holiday. However, the Malacanang Palace promised to provide live updates and video highlights on its social media accounts for the sake of those who will not be able to monitor on television. Follow the President the moment he arrives mid-afternoon at the House of Representatives where he will be welcomed by the Senate President and House Speaker. After the Senate President and House Speaker call the joint session to order, President Duterte will then deliver his first SONA (around 4 p.m.). The Palace earlier mentioned it wanted to center on what the President’s message is to our people. The speech will be a reflection of the President’s low-key but compelling personality, more concerned with substance than pomp. Veering away from the finger pointing and blame game of the past, President Duterte instructed the members of his Cabinet to submit their inputs to the SONA. These include agency targets and deliverables to accomplish his vision of genuine and meaningful change in the next six years. The speech is likewise an opportunity for the President to spell out his legislative agenda to both Houses of Congress. Duterte’s first SONA is also expected to touch on his campaign promises and enumerate his achievements in fighting drugs, crime, and corruption and in winning the peace in all fronts in the 25 days he has been in office. “The SONA was revised several times,” revealed Presidential Communications Secretary Martin Andanar. “And it will be in English as the President is more comfortable speaking in this language,” Andanar said. “The speech would probably last based on our online application to calculate our actual time is more or less 38 minutes. If you would include the applause and some ad libs by the President, it could take longer,” Secretary Andanar ended. Whatever pronouncements the President will say in his speech – the highlight of the SONA – one thing is certain: Our people will be glued to their television sets and listen to the “powerful message of change” set to chart the nation’s course in the next six years.